State Senator Max Wise speaks to a group of Campbellsville University students and community members Tuesday night about Ethics and Politics. 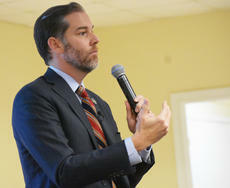 The intersection of ethics and politics was the topic of discussion at a lecture event at Campbellsville University Tuesday night with State Senator Max Wise of Campbellsville speaking. 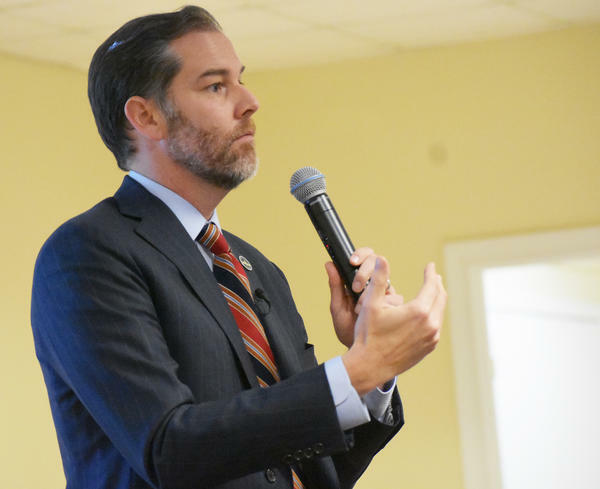 Wise, who represents the 16th Senate District, spoke about several issues the state faces and the morality of such issues, but also spoke about life as a legislator and the ethics of being in such a position. Wise’s seven counties that he represents, which are Taylor, Adair, Russell, Cumberland, Clinton, Wayne, and McCreary counties, are some of the heaviest Republican counties in Kentucky, so he knows where the majority of his constituents stand on a lot of issues, but part of being a legislator is recognizing that not every constituent thinks the same. He noted this in reference to how region plays a role in morals when it comes to politics. Wise spoke about the temptations of being a legislator and the pitfalls that many people who make their way into government fall into. Among them include the seduction of power, ultimate allegiance to party, and losing one’s own moral compass and identity. Wise said the ultimate allegiance to party is “one of the worst things” he sees in the legislature and it’s something he has witnessed other legislators do, in which they try to kill any bill that comes from the other side. 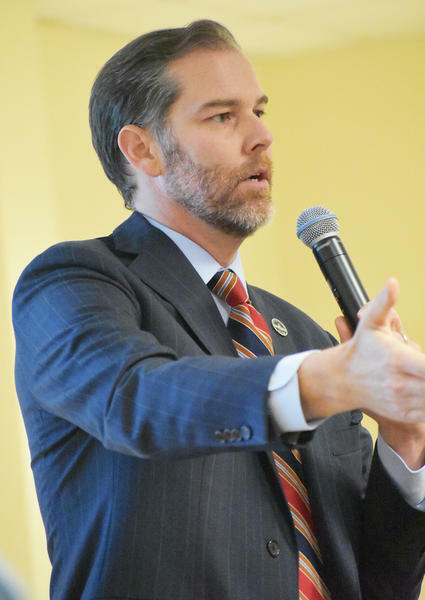 Wise also spoke about the rural vs. urban divide that is manifesting itself in Kentucky, as it is in several states and the ideologies and values that drive people in those regions. When it comes to moralizing issues, Wise said that liberals and conservatives moralize issues in equal measure. He said it is dangerous to get into a mindset of thinking either the left or the right is the cause of all problems. He also shared what he calls “advice to adhere to” when it comes to being a politician. Wise said it is important for him to stay close with people he knew prior to entering politics, reviewing material from his first campaign for perspective, staying open-minded and willing to learn, respecting others opinions while fighting for his own values, and prayer, among other pieces of advice. The event was opened up for questions from audience members, in which one question was asked about how politicians from the left and the right can come together to find solutions to issues without compromising their convictions. Wise said it can be done, but it involves legislators trying to find some common ground and be willing to listen, and said that sometimes even something as simple as legislators from both sides coming together to share a meal. “Sometimes it can be something just as simple as breaking bread together can make a difference,” Wise said. Wise noted that he and Democrat Sen. Morgan McGarvey of Louisville had spoken about the idea of legislators having a baseball or kickball game to promote cohesiveness and unity. The lecture was part of Campbellsville University’s Quality Enhancement Project. The Quality Enhancement Project (QEP) is a component of the university’s Southern Association of Colleges and Schools Commission on Colleges.